There are hundreds of thousands—if not millions—of images of the Buddha Shakyamuni that exist in the world today. Some are big, some are small, some are made of precious materials like gold, while others are carved of stone, cast from bronze, molded from plastic, painted on silk, or printed on paper. What makes one image of the Buddha Shakyamuni more sacred than an other? Is it its material composition, its age, its owner? Is it all of the above, or is it something else? The Jowo Shakyamuni, or Jowo Rinpoche (Rinpoche means ”precious one” in the Tibetan language), is a larger than life-size image of the historical Buddha Shakyamuni housed in the Jokhang Temple in Lhasa, Tibet. Today, the Jowo Shakyamuni can be seen seated against a resplendent gold and bejeweled throne. The image itself is made of gilt metal—the effect is an image of gold hue with shocking blue hair. Jowo Shakyamuni is seated with his legs in the lotus position or padmasana. His left hand is in the mudra (hand gesture) of meditation (dhyana mudra) and his right hand is in the gesture of “calling the earth to witness” (bhumisparsha mudra). Together, these postures signify the moment of the Buddha’s enlightenment. He is shown wearing a thin monk’s robe, which drapes over his body and covers his left shoulder. When dressed, Jowo Shakyamuni is presented with a magnificent jeweled crown and robes. Read more about Buddhism here and here. The sculpture has undergone restoration and reconstruction over its history. The most recent of which took place after the Cultural Revolution. It is not known what the image may have originally looked like in the seventh century when it was made; however, early texts describe the sculpture as being depicted in a similarly enlightened state (seated in padmasana with hands in bhumisparsha mudra). One of the main variations is described in an eleventh -century text titled the Vase-Shaped Pillar Testament—the earliest written description of the image—which states that a wrathful deity is seen protruding from the Buddha’s neck. No such wrathful deity can be seen today on the sculpture. Similarly, the resplendent crown and robes that the sculpture is seen wearing today are much later additions. 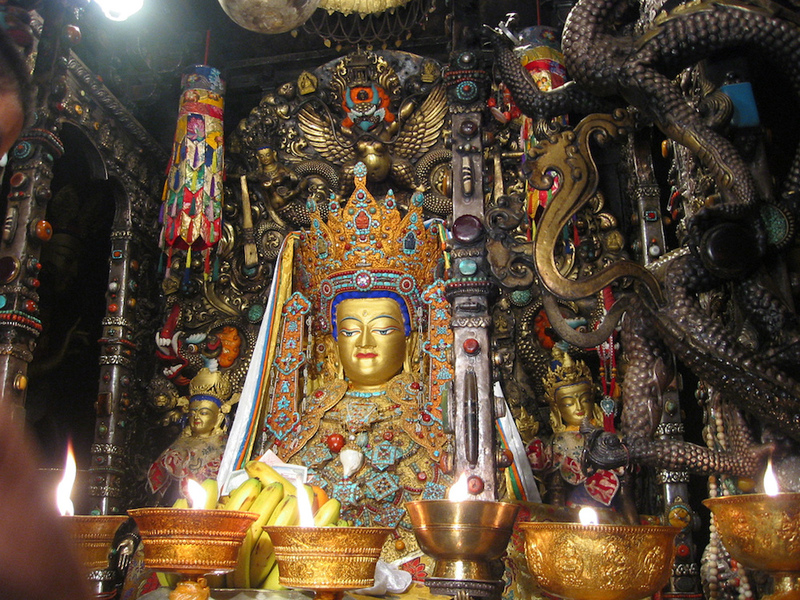 Nonetheless, the continued restoration and veneration of the Jowo Shakyamuni over the course of its 1300-year history is a testament to its religious and cultural importance in Tibet. The Jowo Shakyamuni is considered the most sacred and important Buddha image in Tibet because it is believed to have been carved by the celestial architect Viswakarma in India during the lifetime of the Buddha Shakyamuni (sixth to fifth centuries B.C.E.). Texts such as the eleventh-century Vase-Shaped Pillar Testament suggest that the Jowo Shakyamuni was sculpted from a life portrait of the Buddha. The purpose of the statue’s carving was to act as the Buddha’s proxy after his parinirvana or departure from the world. The religious significance and sacred power of the Jowo Shakyamuni therefore comes from its actual likeness of the Buddha as well as its having been carved by Viswakarma. Such claims of likeness and celestial origins are not unique to the Jowo Shakyamuni—the Emerald Buddha in Thailand and the Seiryoji Buddha in Japan have almost identical origin stories. While texts regarding the sculpture’s origins and history would like us to believe that the Jowo Shakyamuni is the most accurate and thereby the earliest portrait of the Buddha, the sculpture in its original form was likely made sometime during the early to mid seventh century C.E. The invention of the Buddha image in anthropomorphic (human) form dates to after the turn of the first century C.E. (circa early second century), with the advent of Mahayana Buddhism during the Kushan Dynasty. The purported date of the Jowo Shakyamuni to the time of the Buddha from the sixth to fifth centuries B.C.E. is not consistent with the development of Buddha imagery in the history of Buddhist art, nor does the actual sculpture conform to stylistic conventions of early Buddha images (read more about early images of Buddha here). More convincing is an early to mid seventh century date of production for the Jowo Shakyamuni. The earliest evidence for the sculpture dates to the seventh century when the Chinese princess, Wencheng Gongzhu, is said to have brought it to Tibet as part of her marriage dowry to emperor Songtsen Gampo in 641. This date also coincides with the foundation of Buddhism in Tibet. What this suggests is that while the Jowo Shakyamuni is not among the first images of the Buddha, its importance is not diminished as its appearance in Tibet coincides with the foundation of Buddhism in the country. While the Jowo Shakyamuni is not a sculpted-from-life portrait of the Buddha, nor is it the earliest image of the Buddha, it nonetheless holds cultural and religious importance to those who worship the image as such. This is evidenced by its continued veneration, the dressing of the sculpture for special occasions and feeding of it as if it were the Buddha on earth. So what makes one image of the Buddha Shakyamuni more sacred than another? In examining the Jowo Shakyamuni, it is the sculpture’s purported direct linage to the Buddha, as well as the belief that it is the most accurate portrait of the Buddha Shakyamuni. There are multiple versions of the Vase-Shaped Pillar Testament. Cite this page as: Dr. Melody Rod-ari, "Jowo Rinpoche, Jokhang Temple, Tibet," in Smarthistory, March 29, 2016, accessed April 22, 2019, https://smarthistory.org/jowo-rinpoche-jokhang-temple-tibet/.